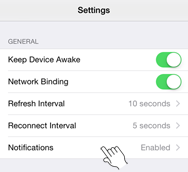 The push notifications feature was added to ChronoSync v4.6. Push notifications work pretty similar to standard email notifications but instead of sending a message through an email server — and reading the sent message with an email client — a push notification is sent directly to your iPhone in near real time. Your phone will chime and the message will appear on your lock screen (if so configured). You can then use the ChronoMonitor app to read and categorize the notification. 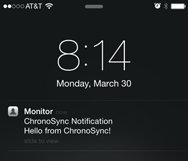 NOTE: To make use of push notifications in ChronoSync, you need to install ChronoMonitor on your iPhone. This feature is enabled on a per document basis, just like email notifications are. In the "Options" panel, expand the "Notifications" pane and turn on the "Push notification to ChronoMonitor with ID" option. 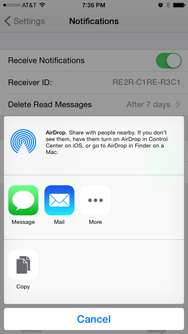 Here you can type or paste the unique ID code that is assigned to the copy of ChronoMonitor running on your iPhone. To get this ID code, fire up the ChronoMonitor app on your iPhone and click the "Settings" tab. Next, tap the "Notifications" cell. 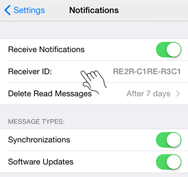 To allow ChronoMonitor to receive notifications, turn on the "Receive Notifications" switch. Note that you must have internet connectivity (either WiFi or cellular) when you do this. Also, your phone will prompt you, asking if you want ChronoMonitor to be allowed to receive notifications — say yes! After turning this setting ON, there may be a brief delay as ChronoMonitor registers itself with the push notification server. Congratulations! You have now configured push notifications in ChronoSync!